With works of art such as the windows of Augsburg Cathedral or the Protestant Church in Langen, he is one of the most significant German glass painters of our time – Prof. Johannes Schreiter. For 60 years altogether, Derix Glasstudios and the exceptionally gifted glass artist have cooperated in all kinds of national and international projects. His new illustrated volume Werke in Glas appeared just in time for his 88th birthday on March 8, 2018 and is available in two versions. 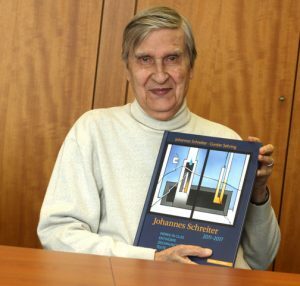 This illustrated volume is the fourth monograph to date, in which Prof. Johannes Schreiter has recorded his development as an artist in collaboration with the art historian, painter and freelance writer Gunther Sehring in the years 2011 to 2017. This means his work includes numerous prints and designs with accompanying texts, which the internationally renowned artist has collected and produced in recent years. Finished works that were also presented as drafts in his previous book can also be found in this latest volume. Anyone who takes a closer look at the artist’s development will soon recognize his preference for clean lines and his design of church windows, which date back to his illness in 1983. He returned seriously ill from a teaching assignment in New Zealand and his doctors had already given up all hope for him. During this difficult time, he turned to faith, which helped him recover and had an enduring influence on his art as well. Since then, his glass windows have represented a visual expression of Bible verses with his very personal, artistic signature. 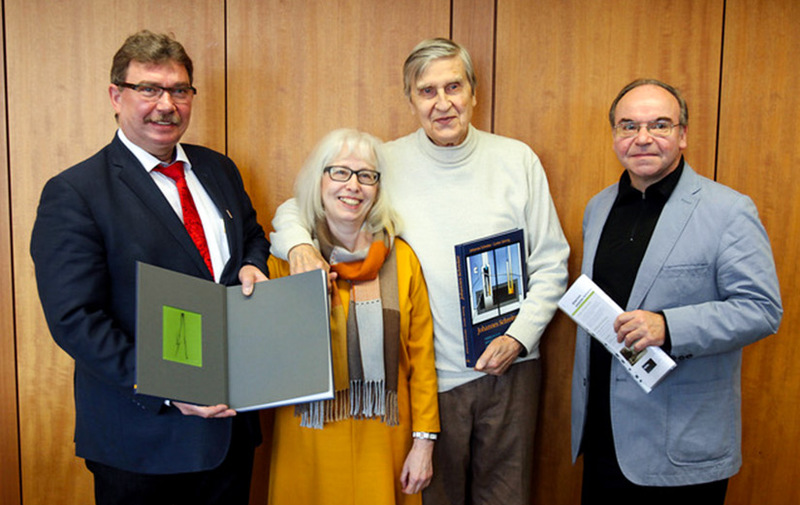 In addition to the standard version of his illustrated volume, the former rector of the Frankfurt Städelschule has also produced a special edition of his work, which is limited to a total of 100 examples. A particular feature of this volume is that it includes a plate, made of hand-blown antique glass from the Lamberts glassworks, hand-painted and signed by Prof. Johannes Schreiter. The plates measuring 100 x 125 mm (4 x 5 inches) are all unique pieces. With a total of ten illustrations designed especially for the book in different colors, no two plates are identical, and it constitutes a collector’s item for any lover of contemporary art and admirer of this renowned artist. The year 2018 is a true milestone in our affiliation with Prof. Johannes Schreiter. In March, we not only celebrate his 88th birthday and the publication of this fourth illustrated book but also a very special company anniversary. He has worked with Derix Glasstudios for more than 60 years, which we are especially proud of. The illustrated volume Werke in Glas is available immediately at any well-stocked bookstore or online for €34.95. However, the special edition can only be ordered through the publisher Derix Glasstudios; the price will be announced shortly. Please send us your request by email or call us – we are happy to inform you about details of the book and process your order.